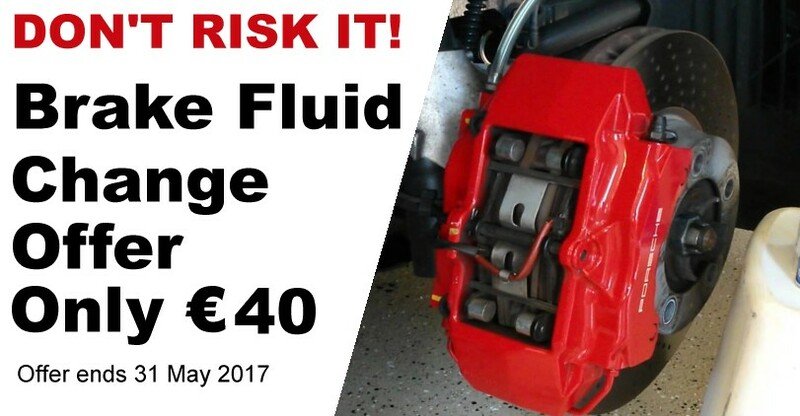 For your car brake fluid change contact us today. Special May Offers. It is advised by the manufactures that the brake fluid in your car is changed every 2 years, but come on how many of us have that done? Well now is the time. Brake fluid is hygroscopic, meaning that it absorbs water from the atmosphere overtime. This if left unchecked can lead to damaged brake components or even total brake failure. We can test the fluid for free and only takes 2 mins. If the test comes back that it needs to be changed, this can take an hour and will cost €45.00. During May 2017 you get €5.00 off. Just mention this offer below when booking, or click it to print it.